Before beginning my internship with The Weinstein Organization, I never looked at a website or an email campaign and thought about it in any other way than myself as a consumer. Since starting in May, when I click to a website or read my emails, I look at these marketing tools in a completely different context. When dealing with our client, Weight Watchers, I have to get out of the mindset of being a 22 year old male. I have to think and look at what we are doing as someone completely different. I never thought I would be spending days at the office in the mindset of a man or woman, who is trying to lose weight, and 30 years or older looking to change their life. Each day I look at what we are doing for Weight Watchers and try to put myself into the shoes of these people. When they open an email or go to a website, what do they want to see that will make them want to keep reading or keep clicking through? We want to push people to join and we have to do that by putting material on our websites and emails that is informative and exciting. To get ideas of how to do this I am beginning to look at what other websites and email campaigns do for their target audiences. When I get an email from Sports Authority with their summer deals, I look at it to see how they convey their information and make their material look exciting. That helps me get ideas to use for when we do our next Weight Watchers website or email. This is something that was so surprising to me when I started. When I get these emails or view a website, I am now looking for ideas to use for our clients or try to critique what another company is currently doing with their material. It has only been a little over a month with The Weinstein Organization and I already look at websites and email campaigns in a new light, as marketing tools. I guess that means I am officially a marketer. Is Pinterest Changing The Way We Look At Websites? 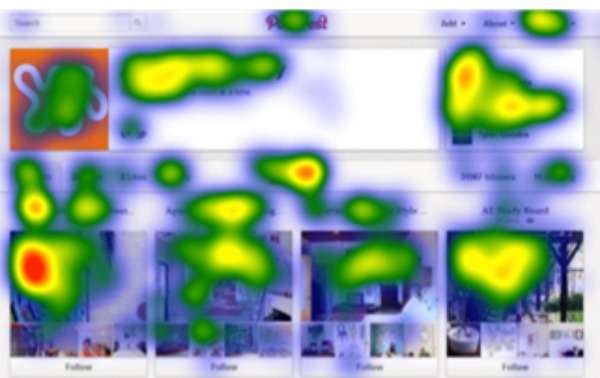 I just read an article about how Mashable recently conducted a study in which they tracked the eye movements of 600 participants looking at various Pinterest pages and the results were quite interesting. Did this catch your eye? It definitely got our attention. We chose to write about this for two reasons: (1) because it was just recently Mother’s Day and this sample subject line is literally speaking to MOMS… so on behalf of The Weinstein Organization, Happy Belated Mother’s Day to all of you Super Moms and Grand Grandmas out there! (2) It is a recent clever trend in email marketing that you should be aware of. Many retailers, such as Red Envelope, are capitalizing on the use of symbols, such as hearts, in their subject lines to call greater attention to their promotional message and to stand out from the clutter, or should I say competition, in your inbox. There are many symbols available to choose from, but you need to ensure that they support your message and are legible in small point sizes. If it is squished and doesn’t make sense, it is not going to help increase your open rates. It is also a good idea to test the symbols across multiple email clients (Gmail, Yahoo, Outlook, etc.) and mobile devices (iPads, iPhones, Blackberry, etc.) before deploying your email campaign to ensure that the majority of your audience can see them. There will always be consumers with outdated equipment that cannot get the full impact of your message, but many email clients have been improving their support for world languages as well as their support for these symbols commonly known as Unicode. Potential Idea? Favorable Response :) Test it on Your Next E-Marketing Campaign! Postal Service QR Barcode Promotion Is Back for the summer. Don’t Expect to Save Very Much. Smartphones now comprise over 50% of the mobile phone users, and the percentage keeps growing every quarter. QR Codes are an excellent idea for the USPS since it merges printed direct mail with the growing mobile technology, and it must have been successful. The USPS is repeating the promotion for 2012 for Standard Class Mail sent in July and August. To qualify the mailer must register in advance. Last year’s incentive discount was 3%. This year the discount has been reduced to 2%. Any discount from the USPS is appreciated, but this discount amounts to $20 savings for every $1,000 in postage. Not much of an incentive. For example, for a mailing of 100,000 pieces at an average Standard Class postage rate of $0.262 per piece normally would be $26,200. Add a QR Code to the mailing and the savings amounts to a whopping $524. QR Codes are not very attractive and there are specific size and other requirements to make sure they can be scanned by smartphones. We encourage clients to test QR Codes. QR Codes are very actionable, can be tracked and measured, can increase overall response, and they're “cool”. But, don’t add a QR Code simply for the USPS incentive discount. It’s not much, and the cost to program the appropriate landing page may be more than the discount received. As Direct Marketers we understand the importance of tracking results and being able to analyze the response from any given project or campaign. It is in this data where we can determine if a campaign was a success and gain valuable insight as to what is driving response. Often times, this data gets buried into endless spreadsheets and boring graphs and charts which doesn't always do this valuable information the "justice" it deserves. So, how do we make this data relevant? Say hello to the infographic. The infographic is not a new thing by any means but the way it can visualize what can often times be considered "boring stats" has made data and statistics fun and interesting again. In many ways the infographic accomplishes the same thing that The Weinstein Organization strives to do every day - blending the art and science of Integrated Marketing. Below is an infographic courtesy of TAMBA, which breaks down the stats, explaining why Pinterest is so powerful with its consumption-friendly audience. We thought this was a great example of how powerful an infographic can be. What do you think?